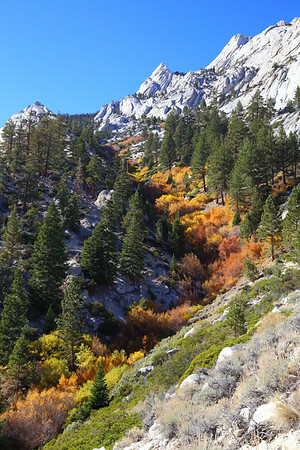 High up in eastern Sierras near California's Whitney Portal region, fall colors arrive early for bushes and trees that hug the streams that flow down from Mount Whitney to mix with evergreens and create an awesome landscape! Wonderful landscape ! Love that stream of colour rushing down the gully !! Beautiful find ! Breathtaking & colorful landscape, love it! This is such a beautiful area--I'm not sure I've seen it with all these colors. Hi Payan, this is Beautiful. Wonderful streaks of fall color! Really neat effect - a river of color!